This was a single that seemed to come out of nowhere, but the A-side was massively beefed up from the track the New Order had recorded for the Salvation OST, where they sort of split duties with Cabaret Voltaire. I bought this in a store [probably Murmur Records] on its release. The extended A-side was a New Order A-side heavy on the beatbox, but with Arthur Baker mixing, you knew that it would be. 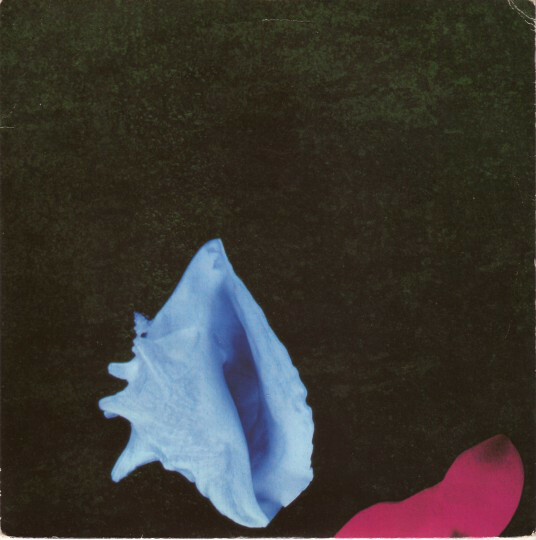 The Peter Saville/Trevor Key sleeve was still completely abstract with no cover identification or typography, as was the style for New order releases of the period. So bold and iconic at the time, but Saville could probably not have foreseen a future where all indie rock stole his ideas indiscriminately. If I see a cover that looks like this now I am assured that it’s some exceptionally po’faced indie rock made by someone who was guaranteed to be absolutely miserable. New Order for me peaked in ’82-’85, but they were far from down for the count in late 1987, when this single was released. I enjoyed Arthur Baker’s dalliances with the band, but preferred the original 12″ of “Confusion” where his patented electro/hip-hop sound was dominant. This track seemed to be a left over from the “Brotherhood” album for every inch of its length. If anything, it could almost be a close relative of “State Of The Nation,” though I actually prefer this song. In its favor, Bernard Sumner’s vocal and lyric was much more intimate and it charmed me in a way that the overbearing “State of the Nation” failed to. New Order records should ideally be intimate; even if they have an expansive sonic palette. To its discredit, 1987 was a shockingly late period to be indulging in the 8-Bit Orchestra Hit, since I had thought that Giorgio Moroder had hammered a thousand nails in its coffin on the Oakey/Moroder album of two years prior. The second track was a no-one-asked-for-it dub mix of the vastly inferior “Confusion” re-recording made especially for the would-have-been-perfect-if-it-didn’t-have-re-recordings 12″ collection “Substance.” The dub mix here was even more perfunctory and abrupt; making it all sound like some more faceless dance act covering “Confusion” rather than a re-recording by the band who had originally recorded it. The full version of “Confusion ” had been released a few months earlier in the Summer of 1987 on “Substance,” and therein lay a tale of embitterment for me. I had been excited to learn that all [or so I thought] of New Order’s 12″ mixes and B-sides were planned to be released on CD format that year as “Substance.” In a fit of naive optimism, I traded off many of my New Order 12″ singles since they would be replaced in my heart and listening with the “Substance” set. Imagine my dismay when the purchase was made; many weeks after ditching my beautiful 12″ singles of: “Temptation,” “Thieves Like Us,” and “Murder” in the mistaken believe that they would be accurately replicated on the 2xCD. I held onto “Confusion” since I knew that only two of the four tracks on it were making the digital leap. I soon discovered that the running order of the “Substance” set had inferior new versions of “Temptation” and “Confusion” replacing the versions that I knew from vinyl. Ideally, I was all set to forgive the band for having the temerity to record and release on CD an inferior version of their finest song, “Temptation,” when I saw that this CD5 single had what was billed as “Temptation [Original Mix]” as the third track. Unfortunately for us, the version on this CD is the same version of the song on “Substance.” Grrrrrrr. To this day, it seems like the only place where the glorious original 8:54 version of “Temptation” made it to CD was in the sloppy2xCD DLX RM in 2009 of “Movement” and in the “Retro” 4xCD boxed set. Though there seems to be a promo disc of highlights from “Retro” that has the desired track. Maybe, I’ll have to secure a copy of that, because it bothers me terribly that this track has been missing for… [checks] 30 years from the Record Cell!! This entry was posted in Core Collection, Designed By Peter Saville, Record Review and tagged 1987, CD singles, New Order. Bookmark the permalink. Never understood why Canadian CD singles were almost always better than both US and UK/EU editions. Given that this year is the 30th anniversary of “Substance”, you’d think London/Rhino would capitalize on that milestone and issue a 4 disc box set with all the proper, full-length 12″ versions and B-sides of all the Factory singles to 1990. Shelf – Actually, I have the 7″ version and dub on the Japanese CD3 single, which I discussed a few years back. You do have a strong point about a potential DLX RM of “Substance,” though! “30 Years Of Substance!” What a great tag line that would make and the idea of everything finally included would make me want to buy it! There might even be room on 4xCDs for the poor remakes, to shut up any naysayers. Damn – I never knew about that JPN CD3! And it has the 7″ edit of the dub mix, which appears nowhere else on CD (the Canadian “Blue Monday 88” CD has the 5:32 full-length dub mix, which is also exclusive to that release). Trying to piece together full singles in CD format like that was/is a pain. Thanks for the intel on that one. A 4 CD “Substance” could indeed include all 20 12″ singles AND the 1987 versions of “Temptation” and “Confusion” (tacked on at the end, of course). ’30 Years Of Substance’ is a no-brainer, and much more practical than the “Recycle” singles box set that Rob Gretton had envisioned. Shelf – Together, like minds such as ours can find a path in the darkness! This is why we blog! I have this CD single and a few more I’ll need to review for alternate versions. PPM noted “this is why we blog”. Amen and thanks as my mini-diversions from both work and maxi-diversions from [wife-assigned] housework are very educational. You guys also have a pretty awesome national anthem. Tell me more about the re-recordings done for Substance. I never knew anything about that. Substance was one of the first cd’s that made it’s way into the household and I thought it sounded awful and didn’t listen to it much.This was back when the sheer novelty of having a cd – of anything – pretty much assured it would get a lot of play in the house just because it was a cd and we didn’t have a lot of them. I agree Monk. The original 12″ of Temptation is the one . However I enjoy the snare sound on the re-recorded version better. As a Canadian I have the original vinyl and CD EP of the 81-82 EP. The cover artwork was done by a Canadian. The other Martha in Martha and the Muffins. I am not sure why Canadian releases often seemed to be more thought through than their counterparts in other countries. Touched never really did it for me. I preferred State of the Nation. I can take or leave it as a song but I love the video. Tim – I have heard many tales about the “Touched By The Hand Of God” video, but since it was never a single in America, there was no airing at all on MTV’s 120 Minutes. To this day, I’ve never seen the somewhat legendary Kathryn Bigelow directed clip. Oh geez……there’s this really long New Order documentary, I used to have it as a Japanese Laser Disc and then finally it came out in the US on dvd. It has all the videos one would want *cough* *cough* made around 1993 and tons of interviews, not just the band but snippets with people like Neil Tennant and Arthur Baker. Just looked it up on Amazon, it’s called New Order Story and new 27, used a fraction of that. It is an excellent profile of the band and hits a lot of the nooks and crannies, even has the Sunkist commercial they did. You really need to buy this if you like the band. Tim – Holy Toledo! I own this on US laserdisc and I watched it once, many, many years ago!! I recall the narration was written by Paul Morley (+) but spoken by a sultry femme; ugh! Disturbing. The dvd version is a director’s cut but if the sultry femme voice (I always thought of it as wasted femme voice) bothers you there’s not much that can be done about that. Tim – I have total cognitive dissonance with the choice of voice talent on that documentary. That is not how Paul Morley sounds! That it was the voice nonetheless chosen was… troubling. As you call it “wasted” I call it a cliché “rawk chick” voice and inappropriate. I just checked my rip of the dvd, started playing it and randomly skipped around probably fifty times and only landed on tedious gal once, that was at the beginning when they’re recapping Joy Division. Maybe give it a chance again and skip past that part? Regardless, head to YouTube for TBTHoG vid, just remember all the hair band acts that were so big in 1987 when you watch it. And where’s Bill Paxton in the whole thing, can someone tell me? Tim – Last weekend I busted out that laserdisc and played it in the living room while I was in the Record Cell, working on a REVO CD project. It was a simulated podcast! You’re right. The rawk chick narration was far less in evidence then memory served. The Sunkist ad that Shelf referenced was there in all of its terrifying glory!! I can’t believe they did that even for all of that money though it ironically featured clips of the band in “hair metal” mode from the “Touched By The Hand Of God” viddy! But the US edition was a single disc! Exactly 120 minutes while the Japanese LD was two discs over 140 minutes. Few videos were played completely through, so it did not function as a video album at all. Which may have been my point of contention with “New Order: Story” from day one. Plus the narration. I think I thought it was a vid album when I ordered it. Ahhh He’s the pyscho boyfriend. Must be the missing first wife from Big Love. A bit of perhaps interesting trivia about the video: as Monk noted, Kathryn Bigelow directed it, which – interspersed with the band’s ‘performance’ – includes random video segments featuring Rae Dawn Chong and the recently deceased Bill Paxton. The following year, Bigelow played a character in the music video for “Reach” by Paxton’s band, Martini Ranch; and that video was directed by James Cameron, who later married Bigelow. Catching up after my trip to London…. First off I have to applaud your line, “So bold and iconic at the time, but Saville could probably not have foreseen a future where all indie rock stole his ideas indiscriminately.” I got a great chuckle from that as Savile has spent most of his career appropriating other’s art and ideas to make his own art. As for TBTHOG, this was the ultimate “post-electro” New Order track. They began as early champions of Electro and then took it somewhere all their own on Low-Life, Brotherhood and with singles Shellshock, State Of The Nation and True Faith. TBTHOG has much in common with Shellshock and State Of The Nation, no really new territory was trod here. Confusion 87 Dub is pure dance floor filler with Michael Johnson doing his best Kervorkian approximation. I am unapologetic in my love of Confusion and it’s early 80’s melange of street electro and post punk aesthetics, but the 87 mix and dub are messy and sound forced. I weigh Temptation 87 and Blue Monday 88 on a judgmental scale as to which was a worse idea and execution. Temptation 87 is soulless. Blue Monday 88 is utterly and completely unnecessary. Finally, I really, really hope that there is no expansive, overblown re-release of Substance. At the time of it’s release it made little to no sense and to celebrate it is beyond irritating to me. The powers that be have never really figured out how to package New Order “Hits” and it’s a bit late in the game to attempt to rectify that fact.